Code Corps is in beta! 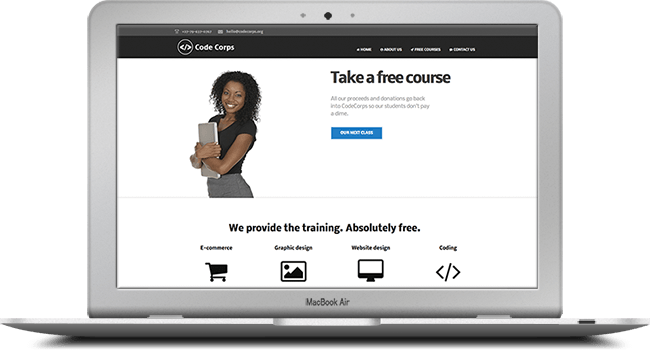 Code Corps (dot org) is in beta! Note: I was approached by volunteers for the Bernie Sanders 2016 US presidential campaign who now run the Code Corps project. I am not affiliated or involved with CodeCorps anymore. So, I decided to start a charitable enterprise. The idea is to provide free coding and design lessons (both in person and online). Ladies and gentlemen, I present: Code Corps. The financial aim is to make money (by providing valuable content and creations to businesses and charities) but the charitable aim is to invest 100% of the proceeds (and donations) back into the enterprise (and make a bigger impact by reaching more students). We (ahem, I) had our first test run on building a website with WordPress last week and I’ve gotten a venue, somewhere between discounted and free, for our first few classes (a big thank you to the incubator space Bandwidth Barn). Please sign up to stay up to date on our future classes (either in Cape Town or online). I can’t quite tell how excited I am about getting back into teaching and organising events (strictly spare time and after-hours, of course). Formerly Business Development and Marketing at the fast-moving Bitcoin Exchange, Luno (South Africa, Nigeria, Malaysia, Indonesia, Singapore and Europe). Currently travelling and doing research on a round-the-world trip. Is Craig Wright really Satoshi Nakamoto?